I initially had no clue what I wanted to write about for this last blog post. However, upon some reflection, I realized that I wanted to bring some of this course’s concepts full circle. Coming from a small town in Maine, and a roughly 700 student high school, there was very little (depressingly little) diversity within the student body. There were maybe four Asian and black students within the whole school. On an even worse note, some students would drive to school with a Confederate Flag flying on the back of their pickup truck, which I just never understood because we lived in Maine… While racism was never a huge problem at my high school, actions like flying the Confederate Flag sent a strong message to white and black people alike. Unfortunately, this was never addressed by administration so it kept happening. While this is a short blog post, I thought it just to at least briefly think about the fact that people in the most northern state of the US fly the Confederate Flag to school. It sends a strong message that, although this country has come a long way towards “fixing” racism, we still have such a long way to go. I initially wanted to write this blog post commending and analyzing the intensely vivid imagery apparent in Anne Moody’s memoir, Coming of Age in Mississippi. 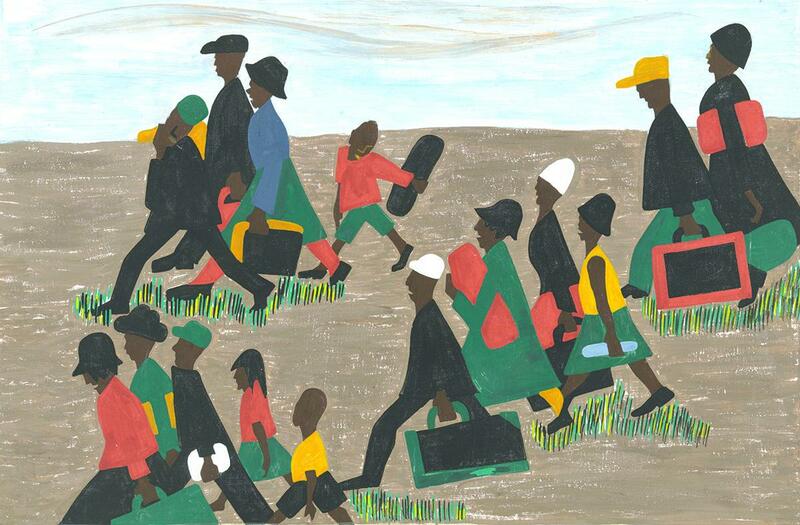 So, I Googled “artwork during the Civil Rights Movement” and began researching the many other forms of art that were created to commemorate the severe hardships faced by black people. As I have never researched artwork during the Civil Rights Movement, this was an exciting and perfect time to begin. As I originally hypothesized, artwork created during the CRM was a means by which artists could convey their own interpretation of the tragic events that occurred at the time. Whether through sculpture, painting, clay, or several other forms, every piece of art had its own story and told its own tragedy or truth. Similarly, most works of art were radical representations aimed to provoke conversation, thought, and action amongst the art’s viewers. Tying this back to Moody’s memoir, the original inspiration for this blog post came when I was reading about her experiences sitting in at Woolworth’s. The descriptions of blood running from mouths, kicking against heads with hard-soled shoes, being dragged on the floor by the hair, and so much more made me cringe (pg. 288-289, ch. 22). Moody’s memoir, too, is only writing, not to say that I discredit the power of this writing at all. However, the disturbing impression that visual artwork can have on someone, especially an outsider, is astounding. Even more astounding is the power that visual art can possess when written words are already incredibly moving. In summery of the very brief points I have made here, the graphic artwork of the Civil Rights Movement sparked debate and sadness within all viewers, which is something that words can only begin to accomplish. As Dr. King touched upon very briefly in class this morning, the election of former president Barack Obama was a momentous stride in United States history. However, being eight to nine years old at the time, I never fully realized what a black president in office meant for the progression of the U.S. and racism. I definitely remember my parents discussing the possible implications if Obama were to be elected, and I vaguely remember very briefly seeing and reading things on the news or in school, but I never truly processed what everything meant. Part of my ignorance, however, was because I knew this would not affect me, or at least not as much as some people. My family never had to worry extensively about racism, so the significance of Obama’s inauguration was never described or discussed at length with me. Another reason for my ignorance came from the fact that I am from a very small, very white town in Maine, in which I was one of maybe four Asian students in my high school. While I did experience some racism concerning the difference in my face between my white peers’ faces, comments never went beyond, “Your face is flat,” or “Why are your lips so big?” Had there been black students in my class in elementary, middle, and high school, however, I can imagine racist comments towards them could have been much more insensitive. Now that I’ve spent time thinking more deeply about this, I do wish that my third grade teachers could have discussed racism and Obama’s impact with us more extensively. Even though we were young and might not have comprehended everything, an introduction to the history of racism, U.S. politics, and racism in the U.S. could have at least been good starting points for future education. Even though Obama’s victory sent massive positive messages internationally and domestically, hopes for many Americans and black people towards positive change in the U.S. was not 100% satisfied or met. I have attached an article from the Washington Post to supplement this comment. Over spring break I spent three days in Boston. One of those days was filled with window shopping up and down Newbury Street, on which there were two churches that had flags or posters which advocated for the Black Lives Matter movement. This pleasantly surprised me because I did not expect churches to be so outspoken about black racism, especially in a large city. A lot of people, nevertheless public churches, would be so apprehensive to voice their opinions about racism. Yet, these churches did so with a simple poster or flying flag. These symbols and efforts to reach out to those battling racism, to those who feel alone, and to those who feel discouraged make me appreciate the littler things in life. Knowing that there are people and places in the world offering help or comfort to those in times of distress makes me feel much more grateful towards those who go out of their way to try and improve someone else’s life. As someone who finds a great distinction between niceness and kindness (kindness being a quality much more inherent and niceness being a quality that is slightly more superficial), simply hanging a poster that says “Black Lives Matter” or “Any and All Are Welcome Here” is a level of kindness that I believe should be exhibited and shared much more in this world. Despite the churches’ kind efforts, however, I also felt sad after passing the churches. I often find myself wondering why people are so cruel to others. We all have our own opinions of anything and everything, but another person’s happiness, safety, and identity should not be judged or attacked. I assume the reason the churches advertised their safe space was either due to the fact that they believed that part of Boston was either not inclusive enough or just to make sure black people knew they could worship there. However, the fact that black people have to even think twice about entering places with no safe space advertising is extremely discouraging. The discriminatory events that have manifested throughout history and shaped our present-day society must stop. If they don’t, suppressed people might begin to lose hope. Alex Alpharaoh’s powerfully raw and vulnerable performance about his life and DACA experience taught me that people battling DACA struggle on a daily basis. DACA fighters must constantly watch their backs and worry about every move they make, especially from law enforcement individuals, which harbors fear and distrust among a large portion of the U.S. Alpharaoh’s story is only one DACA story, but is an extremely important one to know in better understanding the negative impacts of DACA. As he told his audience of the multiple obstacles he had to face, Alpharaoh’s constant struggle was more than apparent. Trying to receive a new passport took months, especially once he was arrested for “disturbing the peace.” Alpharaoh, however, simply walked outside and a police officer thought he was suspicious because Alpharaoh did not have identification on him. Among passport and legal barriers, however, Alpharaoh also faced some intense personal struggles. When trying to decide whether to go back to Guatemala to receive an official passport, the main unknown question to Alpharaoh was whether he would be allowed back into the U.S. Alpharaoh just wanted to be able to get back home. Alpharaoh never had the stable assurance that any white U.S. citizen would face if traveling out of the U.S. I am confident that my father, being a white male, would have absolutely no problem getting through U.S. customs or Border Patrol if he wanted to travel to Guatemala for seven days. Alpharaoh, however, never had an instance of calm travel. From the minute he stepped onto his departing plane at LAX to finally landing back in LA and going through border patrol, Alpharaoh knew his whole life would be on the line. Alpharaoh could not even completely enjoy his time in Guatemala, because he was so concerned about what regulation Trump would enact, or if he would be arrested the second he stepped out of the plane returning home. While I only briefly discussed some of Alpharaoh’s struggles with DACA, his uneasy journey to Guatemala was only a piece of his life puzzle. In reality, however, Alpharaoh and so many other non-U.S. born people constantly live a life of fear and anxiety. As long as the U.S. has yet to find any permanent and positive solution for immigrants, foreigners, and people involved with DACA, a large portion of this country will live in constant uncertainty. Angela danso Gyane on What Will Come of Starbucks? Angela danso Gyane on Trump’s Incredibly Articulate and Compelling thoughts on Race Relations in the U.S.